NORTHRIDGE, California – The 85th Academy Awards were held February 24, 2013 at the Dolby Theatre in Los Angeles, recognizing the cinematic achievements of 2012. 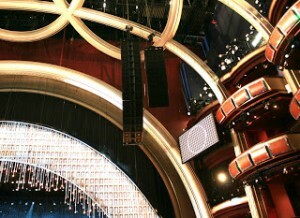 For the event, Valencia, California-based audio system provider ATK Audiotek deployed the sound reinforcement system, which was designed by Pat Baltzell of Baltzell Audio Design and included HARMAN’s JBL VERTEC® line arrays.One of the biggest nights in entertainment, the 85th Annual Academy Awards were broadcast live on ABC and were hosted by Seth MacFarlane. The evening’s highlights included Argo winning Best Motion Picture of the Year, Daniel Day-Lewis earning Best Leading Actor for his performance in Lincoln, and Jennifer Lawrence winning Best Leading Actress for her role in Silver Linings Playbook.The main PA system included 30 JBL VERTEC VT4889 fullsize line array elements, suspended in two arrays of 15 enclosures each, and 16 VT4880 fullsize arrayable subwoofers, suspended in two arrays of eight subwoofers each. The system also featured four suspended side fill arrays, each including four VT4886 subcompact line array elements (for a total of 16 VT4886 elements), while six JBL MS28 loudspeakers were temporarily installed for under-balcony area coverage. A total of 65 JBL Control 25T surface-mount loudspeakers were temporarily installed under audience seats in the VIP seating area. As in years past, Baltzell relied on VERTEC line arrays for the Academy Awards. “This setup has been successful for a number of years and the VERTEC system always provides reliable performance and enables me to focus on the event with total confidence in the technology,” Baltzell said.